Providing a low cost travel option for those who don’t need a car of their own, all of the time. We have an excellent Car Club in St-Andrews that is operated by E-Car. They have 10 vehicles available for 24hr instant access through their smart booking system. Once you have joined up as a member, you are able to hire a car or van by the hour through an instant online booking system. Our car club is all electric too. So, not only are you getting instant access to a vehicle, you can also be happy that these are zero emissions vehicles. The St Andrews E-Car Club provides easy and affordable access to vehicles 24/7. Here are some reasons why car clubs really are the way forward. Owning your own car can really be a hassle – repairs, servicing and renewing insurance …always something to worry about. But what if you could leave all of that to somebody else? What if you could walk down the street and climb into a clean, new car that has its own guaranteed parking space, and drive away? That’s what a car club can do for you – all the convenience of a car without the stress of owning one. Just book online or by phone, and you’re sorted. A car when you need one, not when you don’t. If you drive less than 6-8,000 miles per year then a car club could save you up to £3,500 a year. Replacing a second family car with car club membership can bring even more cash savings. A lot of people don’t notice the true costs of running a car, but when you add up the cost of tax, MOT, fuel, servicing, repairs, depreciation and parking you could be looking at an average of over one hundred pounds a week! Car clubs give you greater flexibility, charging only for the time you use the car, not when it is sitting on the drive. You can free up your budget to spend on something more exciting! Joining a car club, instead of running your own car, is a big step towards reducing your carbon footprint and living a more sustainable life. In one easy move, you can cut your carbon emissions, your contribution to congestion, and the clutter on your street. In the UK, the average car owner produces over 2 tonnes of carbon dioxide driving each year. Joining a car club can drastically reduce this as car club cars are more environmentally friendly and are used more efficiently. On top of this, one car club car replaces over 20 private cars – you can see how much that will reduce traffic jams, and free up parking spaces. It’s a win-win situation! Why wouldn’t you? You can use E-Car to travel between sports matches! For more information, please contact Elaine Finlay or Caroline Sing from the Athletic Union. You can now use E-Car for business travel through the University procurement system! First, contact Sarah Latto (sl16@st-andrews.ac.uk) in Procurement. She will need a cost centre to associate charges with as well as other relevant documentation (Sarah will provide details). She will then order you a ‘key’ card to access the cars. Once you have your ‘key’ card, you’re away! Find out general information about car clubs on the Carplus website. Further E-Car information can be found here. For an electric car charging point map, please see here. Can’t do without a car? Why not consider purchasing an electric vehicle next time you need a new car? The Energy Saving Trust has a great page packed full of information on electric vehicles. It tells you all about the grants on offer, information on running costs, recharging facilities, and more. 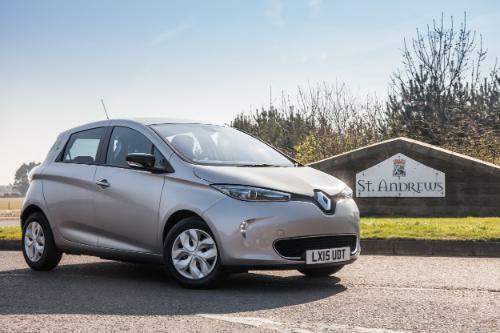 Electric vehicles are the future, why not be ahead of the crowd and try out one today?